If you have never heard of Santorini, then you should know that it is a beautiful Greek island. There are many different islands in the Cyclades group, but Santorini is proving more and more popular with holidaymakers who want to get the authentic Greek experience. Here, we are going to talk you through 10 reasons why you should visit Santorini. Keep reading if you’d like to find out more. The views that you can see in Santorini are famous worldwide. Looking out onto the ocean or across the island is beautiful and you can really capture some amazing photographs to keep the memories with you forever. Don’t miss out on these views, make sure to book your visit to Santorini soon and go hiking to get the best possible view. All around the island you’ll see plenty of chapels and other religious buildings. The most prominent denomination in Santorini is Greek Orthodox but you’ll also find plenty of Catholics worshipping. Look out for the blue roofs on the white buildings as these after often chapels. Santorini villas are some of the best in the world and you will feel very relaxed if you stay in one. Make sure to skip the hotel and try out one of these beautiful villas where you get your own private pool fromBlueVillasand the amazing views are guaranteed.These villas are made to be luxurious, so you can even get a private chef to come along and cook for you! If you are looking for some amazing beaches, then you should head to Santorini. These beaches are made up of volcanic rock due to the formation of the island and this creates a lot of beautiful beach areas for you to enjoy.Make sure to check out the Perissa and Kamari beaches for some relaxation. The soil that is present on this island helps to create some amazingly tasty wines and this is why Santorini is known for its wine. Make sure to visit the SantoWines Winery if you get a chance to get a real taste of Santorini. You might even catch a glimpse of the amazing sunset as you sit on the patio there. Alongside the wine, you’ll find that the traditional Greek foodis everywhere you go. You’ll get to try all of the amazing Greek dishes and you should be able to come away having fallen in love with this food culture. Make sure to try some Greek salad with Feta, Tzatziki and a few Gyros while you are there. Many people who have watched the sunset in Santorini have claimed that it could be the best sunset in the world. This is because of the beautiful colours that appear due to the location of the sun and the water. If you are planning on seeing the sunset while you are there, make sure to visit Oia which is known for being the best sunset location. 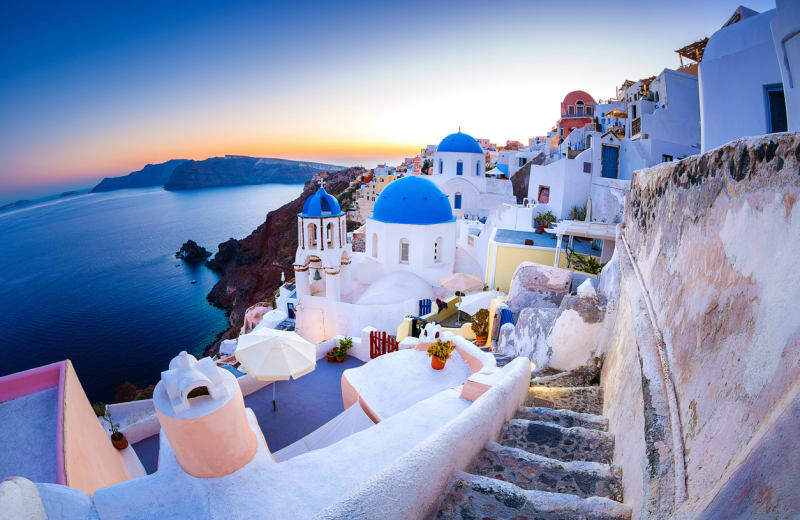 Greek architecture is known worldwide for being incredibly impressive and if you take a trip to Santorini then you’ll be able to witness some of it in person. Make sure to visit the excavations at Akrotiriwhich have been around since 3600 BC. This is not something which should be missed, and you will be really impressed with what you see. If you are into your water sports, then you’ll love what Santorini has to offer. The best locations for water sports are Kamari and Perissa where you’ll find everything from diving to banana-boating. Of course, it if you are taking your kids and they want to enjoy the water sports, you can always relax over at the bar and restaurants that line the beaches here. The final reasons why youshould visit Santorini is the amazing weather. You’ll find that it is very hot a lot of the time with July being the hottest month. Although the winter is slightly colder, it still is on average warmer than Britain with December being the wettest month. Make sure to head over in the summer for guaranteed heat and a great tan.